Mastic, or pool caulk, is the essential buffer between the coping around your pool and your deck. Without it, your deck takes the brunt of all the pressure from shifting grounds and temperature changes, not to mention water slides behind your pool shell, leading to leaks and rotted wood decks. In an ideal world, you would be able to replace it before it starts to crumble, but there isn’t any good way to estimate when the mastic will need replacing. Do you live in an area where temperatures change radically? Do you have a leaky deck where splashed-out water can sneak down behind the shell? These all change how long mastic can do its job, and you probably don’t want to replace it before its time. There are a few signs that you can look out for, though, that may hint at failing mastic. This is a giveaway sign. Mastic is an organic substance that can get old, and when it reaches its end, it can start to peel off or crack. It’s also possible that it wasn’t properly applied the first time. Whatever the cause, cracking mastic won’t provide the give that your concrete needs and you risk the concrete cracking from stress. This is a common sign. When the mastic doesn’t move enough to accommodate the natural expanding and contracting that concrete does with temperature changes, the concrete takes on all the stress of moving and starts to show the strain. This causes cracks, which can expand rapidly. These cracks may require you to resurface the deck as well as replace the mastic, so you will want to act as soon as you see them. This is another common sign. Mastic bridges and holds together the concrete coping and concrete deck, so when it fails, the decking is free to shift away from the coping. The result is a crack between the two which can grow over time. 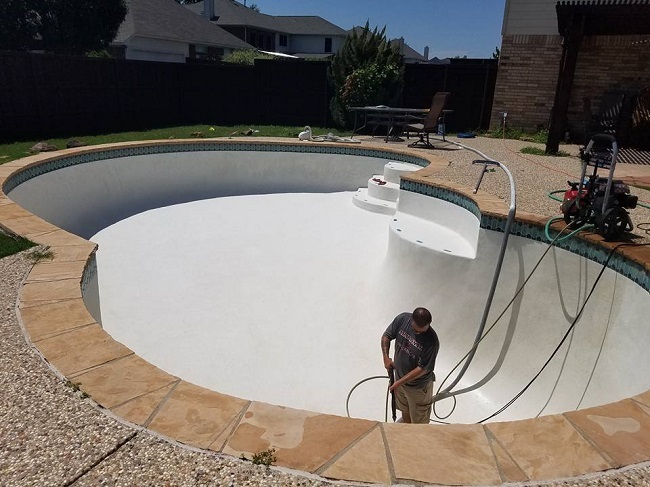 Since this allows water to sneak behind the pool’s shell and damage the surrounding area, you want to replace the mastic as soon as you see this separation. If your deck rises up over the top of the pool, the ground underneath has probably shifted. This shift can weaken the ability of the mastic to seal the pool. It’s also possible that the shift is caused by water getting under the deck, which can be caused by the mastic failing. Either way, a professional should test your mastic if the deck starts rising. Tiles fall off for a number of reasons, but one of them is that the surface that they are attached to are moving too much for them to keep their shape. Essentially, the mastic keeps the concrete from shifting around too much, and when it fails to do its job, the surface shakes the tiles loose. If you see tiles come off and you don’t think the glue is failing, you might want to replace the mastic. If you are seeing these signs, don’t panic. A professional can assess the state of your pool and help you get your pool back to normal. Aquanomics Pools, for one, would love to provide you with an inspection. Please contact us to see what we can do for you.